Mark Croghan started running like many of us did. In seventh grade he decided to make a change from the usual sports kids play, little league baseball and football, and joined the track team. At first he wanted to be a long jumper, but when the coach was looking for volunteers to run the mile he readily said yes. He finished number one on his team in 5:27 and placed second overall. He was hooked on running from that point on. By the time Mark reached his junior year at Green High School he was a top runner in Ohio. He won his first state championship that fall in cross country. His senior year he placed sixth. Not defending his title became a motivating factor for him to set his goal to win both the 1600 and 3200 at the Ohio State Outdoor Track Championships. He did just that winning the 1600 in 4:10, then two and a half hours later winning the 3200 in 9:14. A big Ohio State fan as a kid, Mark took advantage of the opportunity to wear the Buckeye uniform after graduation. “I struggled my first two years at Ohio State,” says Mark. Needing a change, he switched events to the steeplechase. He ran 8:56 the first time out. Later that year there was a coaching change. Mark’s new coach stressed system training. His career dramatically took a turn for the better. That initial season under a new coach he placed ninth at the NCAA Cross Country Championships. It was at that moment he thought he could really be good. The following spring he won his first NCAA steeplechase championship by starting his kick with 600 meters to go. The following year he would win both the NCAA and USA Outdoor Track Championships. 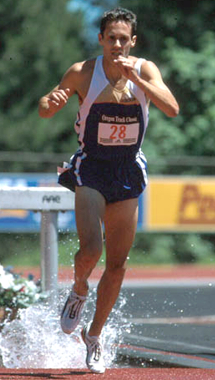 Mark would go on to qualify for three USA Olympic and four USA World Championship Teams. He’s won five USA steeplechase championships. His personal best of 8:09.76 is #3 all-time U.S. He owns five of the seven fastest times ever run by an American. You could argue he is the best steeplechaser the U.S. ever had. No other U.S. athlete has more times in the 8:09 – 8:11 range than Mark Croghan. Mark currently resides in Wadsworth, Ohio with his wife Kimberly and three sons; Cameron (10), Griffin (8) and Grayson (2).